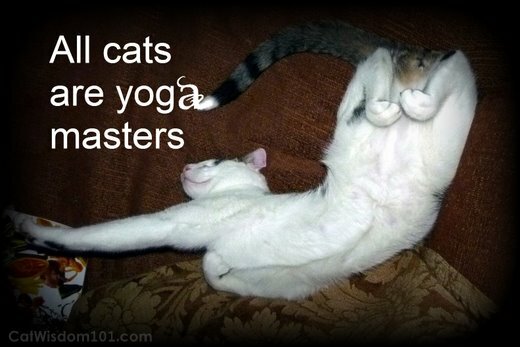 We all know cats are natural yoga masters. Odin demonstrates his favorite pose but he needed a yoga mat of his own. Luckily, Pippy and Paige from Feline Yogi send us one of their fab yoga mats to test which comes with an attached catnip stuffed toy ball on a rope. The holistic mats are made with phthalate free dyes and inks. You can win one plus we have a limited time discount coupon. The Yoga Cat Mat is cool place to lounge, place catnip or treats on without messing up carpets and can be an easy to clean feeding station for messy eater. Our suggestion would be to use the mat for vet visits. Pets hate the cold, hard slippery surface of a stainless steel examining table. A couple years ago I asked my vet Dr. G. to use my yoga mat on the examining table of his mobile clinic. He liked the idea so much he’s used them ever since. Not all vets are as enlightened as him but you can bring your own feline yoga mat. The Yoga Cat Mat is the purrfect size. It rolls up up neatly and can be sprayed with a calming product like Feliway to make the vet visit more blissful. Merlin our feline Zen Master checked out the mat and gave a Meowommmmm of approval. 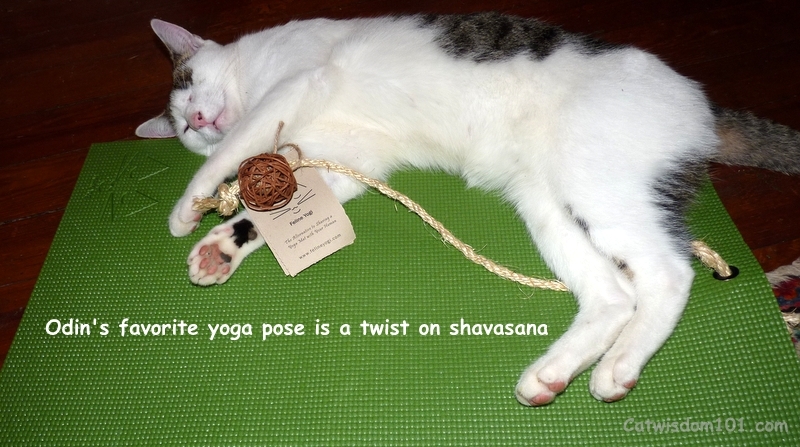 Now, you can win a Cat Yoga Mat for your feline Zen master. 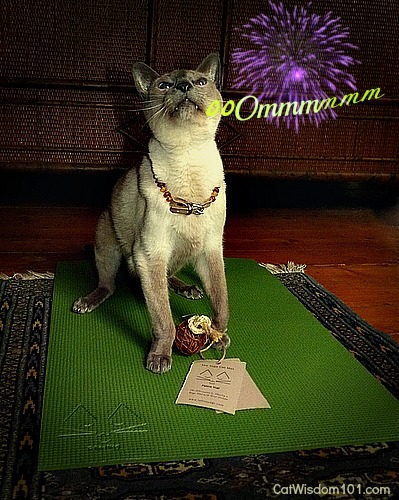 Our Yoga Cat Mat giveaway giveaway ends 11:59 EST July 5, 2013. U.S. and Canadian residents are eligible. The winner will be selected via random.org and announced on July 5, 2013. The winner will be notified via email and must respond within four days with their shipping address or an alternative winner will be selected. Good luck! For extra chances to win, share this post on Facebook, Twitter, Google+ or Pinterest. Mention in your comment where you shared. Pippy is offering a 20% discount on her Yoga Cat Mats at her Etsy shop! your discount. This discount is good until July 12, 2013. 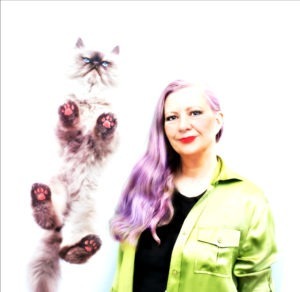 Please vote for as many blogs or categories as you like including Best Cat Blog, Best Over All Blog and Best Designed Blog etc. You can vote for us in more than one category. For Best Video, may we recommend our Vet 101 video how to give a cat exam at home Just cut and paste the URL. haha that firework effect is just the best! For an extra chance to win, I shared this contest on FB. Thanks, meow! I love this yoga mat. I was just reading someone above who posted they thought it would be good for vet visits. That is a great idea! Those hard, cold, metal tables are the worst! One entry please and thanks! I love the vet idea–that might make Thunder feel more secure. I won one of these on another cat blog and my cats love it. I love the pictures of your cats using the Feline Yogi yoga mat. I have to have one. Thank you for the giveaway and I sure hope I win! Pinned on Pinterest. OMC! I never thought to take something to put on that cold, stainless table at the Vet’s office! Now, I have to have one. Thank you for the giveaway and I sure hope I win! My Kallie and Ollie have trouble sharing but they would love to try and share this yoga mat! What a unique idea! My cats would love it! Maybe my kitties had their own yoga mat they wouldn’t run and flop down on mine as soon as I put it down! Pawsome yoga mats for cats! I would love to have one to bring to the vet- thanks for a CATabulous idea! Odi, you’re the real kitty yogi. Maybe we can share our Yoga Practice together and I’ll show you the tree pose – a very humbling pose indeed. MEOWYOGI! You are very good at yoga Odin. I can only dream that I will get to that advanced level. That yoga mat is really cool. We’d love to practice our yoga poses like Odin, the master! What a handsome picture of Merlin! Please purr Merlin because we have nominated you! If our human wins this, we promise to ignore it as we do most everything else she brings for us. But maybe this would work nicely in one of our boxes. Our human would like that since you can’t clean a box with water. Odin has that yoga thing down pat … er…. down cat! MOL. These are so neat. We would love to be entered. Great idea to take them to the vet too. Thanks for the giveaway. I have been voting for you. Good luck. How cool is this? The Teenage Mutant Ninja Kitty Horde is interested in testing a mat more thoroughly. I nominated you and I will vote on the 5th of july till my paws are glowing! Good luck to all – a yoga mat is great – even my granny has one! Thanks so much Easy. You’re top dog to us! Oh!! I’d LOVE a yoga mat!! – Crepes. 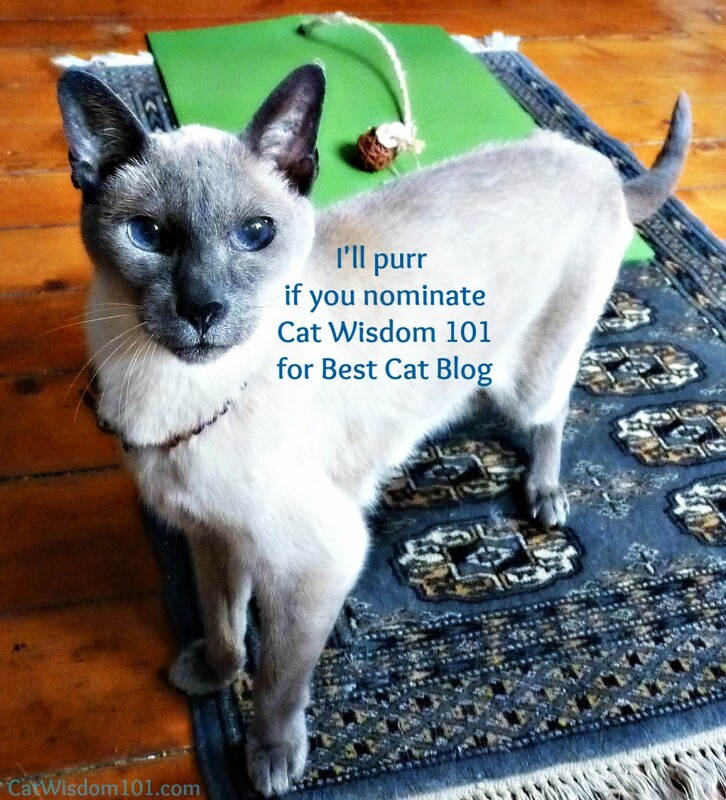 best fishes to everee one on winnin de mega awesum yoga matt…N merlin…get yur purr motorz revved up dood 😉 ! !~~~~~~~ heerez ta a grate week oh end two one N all !! Wow, we need that yoga mat so we can purrfect our yoga moves. It is a great thought to use Cat Yoga Mat for the pat cats! We have our own Cat Yoga Mat from Pippy, the CEO of Feline Yogi, so we don’t need to enter – but I DO want to let everyone know we LOVE ours! Each of us spends time on the yoga mat every day, and we are more serene and limber for it! I like your idea to use the mat at veterinarian visits. My vet does use mats but I would definitely prefer to use one from home. Thanks!